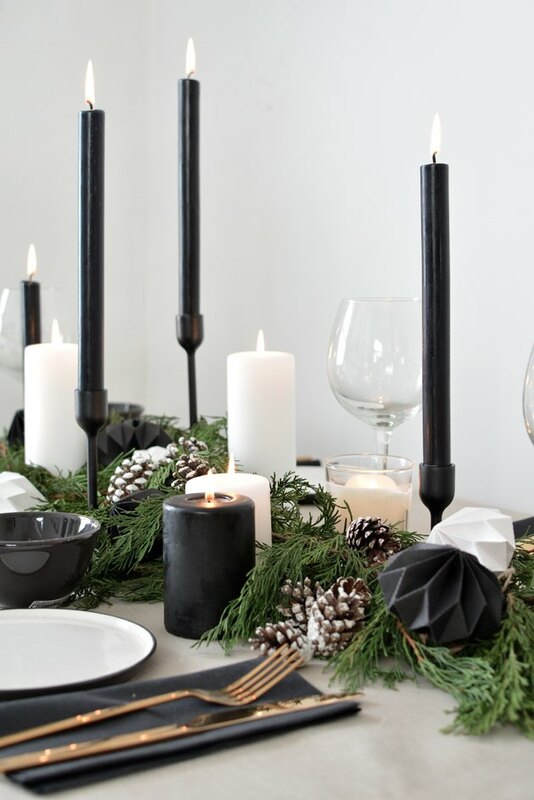 If your taste leans more toward minimalism than maximalism, this moody and romantic Scandinavian-style tablescape is a perfect option for your winter gatherings. The palette is muted and atmospheric, inspired by all the things we love when cold weather arrives. (Think cozy dark nights with roaring fires and serious candlelight vibes.) Once you've gathered together the main elements, it doesn't take much effort to set up this seasonal Insta-worthy table. A linen tablecloth lends an instant sense of occasion, we've used a muted earthy tone to set the groundwork for our table. If budget is an issue, consider buying heavy cotton or linen by the yard or roll — it's generally less expensive to buy by the meter, and the unfinished edges lend to the rustic elements of the table setting. We like the slightly organic look of creased fabric for this type of settling, so put the iron away — think natural rather than polished. We like to use an eclectic mix of tableware in complementary colors to create an informal feel. In a nod to classic Scandinavian style, we've opted for a monochrome palette. 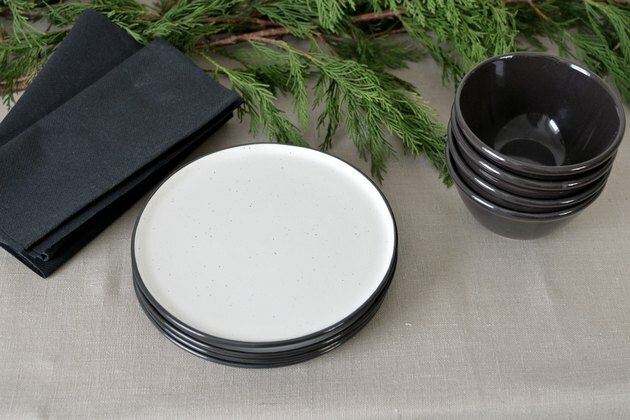 If you're using white plates, consider adding some darker accents in the form of small bowls or side plates. 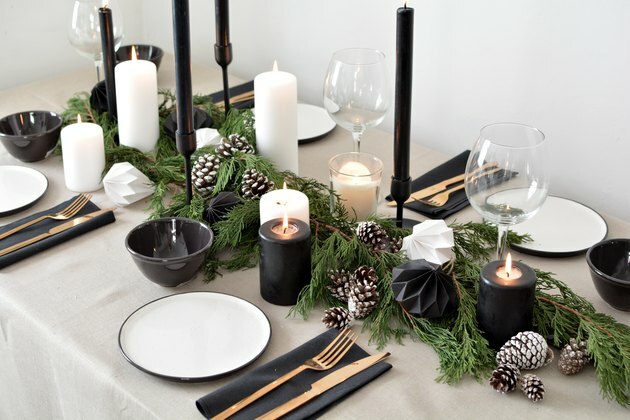 Gray or black napkins make a striking impact, while gold colored cutlery adds a touch of festive luxury. Nothing creates an instant sense of intimacy and atmosphere like candlelight — it's the key to a cozy feeling around the table. 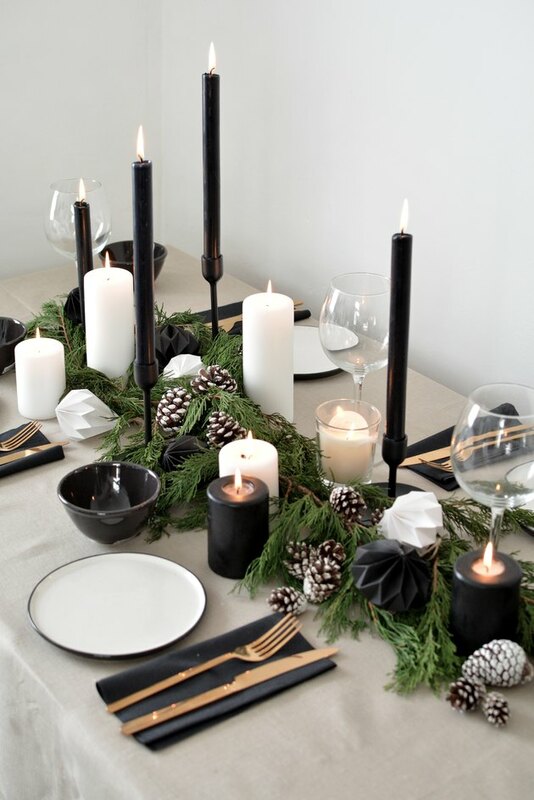 For visual interest and added warmth, mix tapered candles with smaller votives or pillar candles across the table. 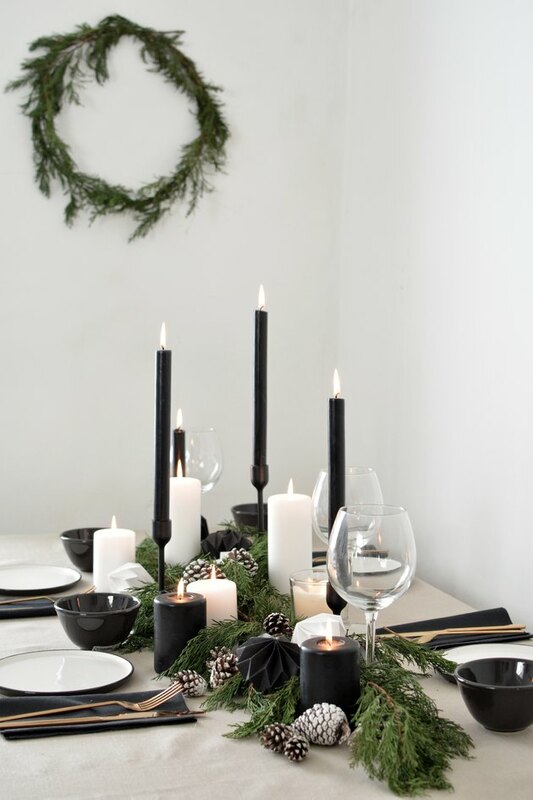 When you're setting out your candles, use candlesticks of varying heights to break up the symmetry . This takes your eyes on a journey along the table. 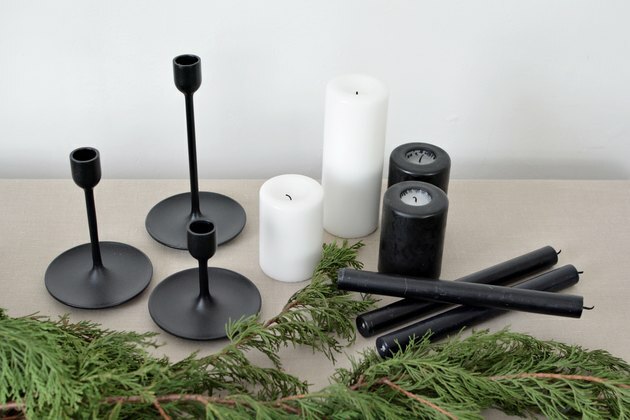 If your candle holders are all the same height, break or cut some of your tapered candles in half before lighting them to fake the effect of varying height. 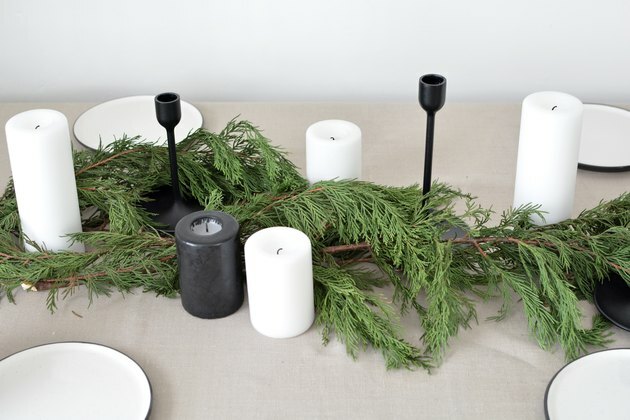 When adding the candles, work outwards from the center, weaving them in among the greenery. Try to keep the arrangement loose and organic, not neat and symmetrical. Invest in a small string of battery powered fairy lights that you can tuck under and around the greenery for an extra hygge points. Build texture and interest with final flourishes. Now you can add some finishing touches to your centerpiece. 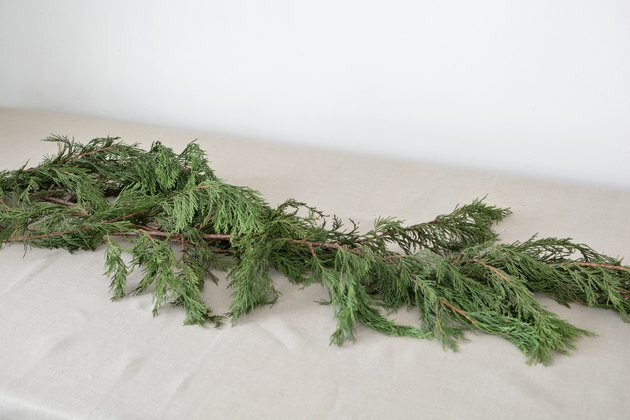 Scatter pine cones along the length of the table — and remember, we're aiming for a "just tumbled off the tree" look so don't place them too strategically. Also, add some black, white, or glass Christmas decorations as additional festive adornment. 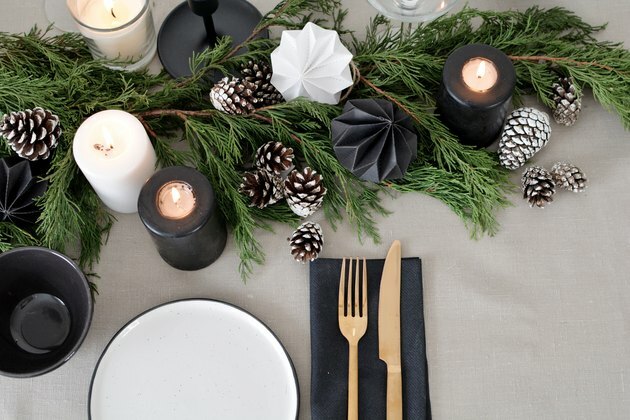 Finally, add glassware to finish your Scandi-inspired holiday tablescape.